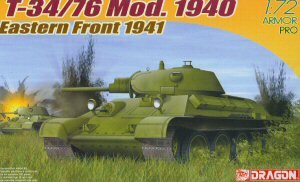 Companies like DML need to be aware that the Soviets never called these "T-34/76" tanks, as that was a German description and did not come into being until the 85mm tanks appeared in 1944. The Soviets did dub the later tanks T-34-85 to show the differences. DML has now added to its "Armor Pro" series (a select part of its 1/72 scale series with additional parts, different moldings, and extras included in the kits) with a gorgeous Model 1940 T-34 kit. Based to some degree on its amazing 1/35 scale kit, DML has managed to shrink the level of details down and at the same time compact the number of parts by some clever molding tricks. One of the most impressive tricks is the use of what DML calls "slide-molding" in which multi-part molds with moving parts are used vice the older "sandwich-type" two piece molds. As a result, they can do larger pieces without either ejection pin marks or sinkholes, and get depth or undercuts in smaller parts. This shows up in this kit in two areas: first, the fact that even in this scale the gun barrel for the L-11 cannon has a hollow muzzle as molded; and second, the wheels come in 14 ready-to-install assemblies vice 28 separate wheels and perhaps axle caps. The wheels are nicely done, with a nice deep grove in between (unlike another company's 1/72 scale kits with solid road wheels or most HO scale armor) and detailed on both sides. Purists will want to drill out the thin flash in the drivers (parts C2) and idlers (parts C1) though, but that is an easy task if you have a pin vise and small drill bits. The hull comes with the correct Model 1940 hull with vertical grille openings in the radiator intakes and a choice between either a solid radiator exhaust grille or one with an etched metal grille instead. This is the same nice touch now offered in the 1/35 scale kits, and DML is to be congratulated for providing it in 1/72 as well. The turret also mirrors its "big brother in construction, and as many modelers have found, if done carefully no putty is needed to fill the gap between the glacis (part A39) and the turret sides (parts A43 and A44). The turret also includes a partial interior as well. The kit provides single-section vinyl tracks, and these still require ACC (cyanoacrylic) glue to assemble. Since T-34 tracks are "dead" track, they will also have to be made to lie down on top of the road wheels. The kit comes with an absolutely gorgeous sheet of decals with many patriotic sayings and markings, but this is essentially unusable. It's not that DML makes poor decals – but the Model 1940s rarely carried any markings, and most of them were destroyed before the fighting spirit of the Red Army prompted the creation of the sayings! Even the painting instructions show only a "protective color" (dark green) tank. Well, it will be handy for other models. Overall, based on its transcended generation from the great 1/35 kits this is a real winner and the highly probable later T-34s (e.g. the Model 1941) will be another great addition to this scale when they are released as well.